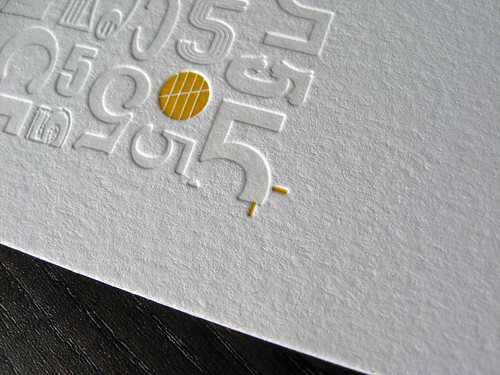 Solid coverage for letterpress cards. 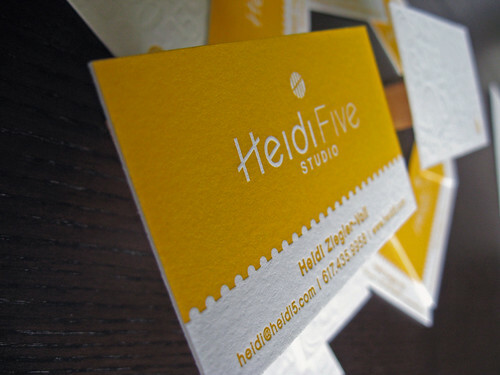 We mentioned a few weeks ago (Dolce Press spotted on the web) that we’d be posting about some crazy business cards we printed for Heidi Five Studio and here they finally are. 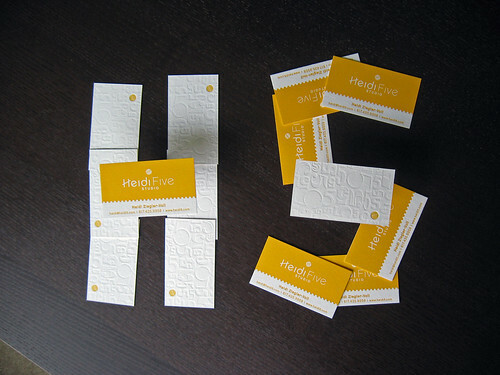 We went a little bit nuts with the photography but we wanted to capture these business cards from every angle. There are lots of cool things about these cards from the yellow solid, to the knockout, and the background patterns, that we weren’t sure where to start. Are all of these photos overkill? Let us know! 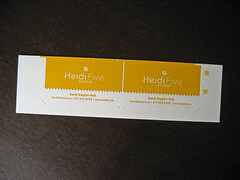 Heidi supplied the design to be printed on the front and back and we took it from there. 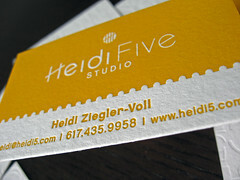 The business card uses two colors, PMS 1225U (a really rich yellow/orange color) and transparent white. 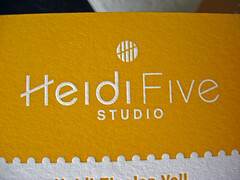 Heidi wanted her cards printed on 220lb Lettra which can present some difficulties with printing a card like this. So, like some other cards we’ve posted about in the past (posts: Aeris Aviation, Cainkade, Inku Photo), we had to duplex them to get the best result. There are two ways to duplex: before or after printing. 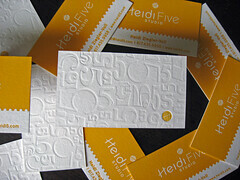 For Heidi’s cards, we duplexed after printing. Why and why? 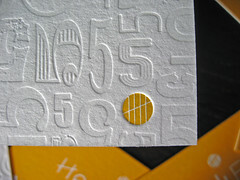 In order to ensure a heavy impression on both sides of the card and good ink coverage. 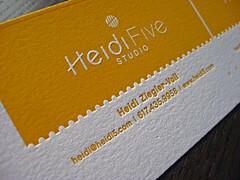 We really love the way the knockout in the solid yellow area remains puffed up, like a faux emboss! 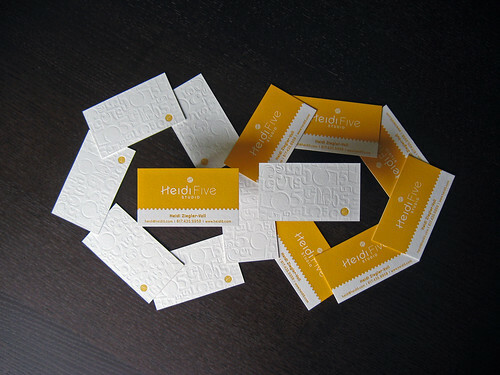 We printed these cards 2-up using photopolymer plates on a 10×15 Heidelberg Windmill. 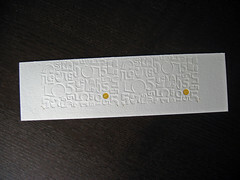 To achieve and maintain the solid throughout the run of business cards we used the ductor roller and the fountain. 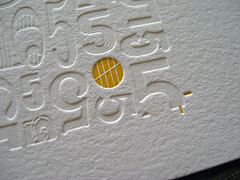 The cards were double hit to ensure that there was no speckling in the solid area as is common with letterpress. Above is a photo of the color on press taken using Instagram. The mix of lighting with an iPhone camera make the color look like a banana! 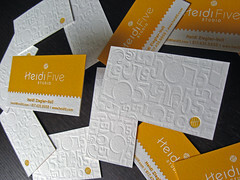 The back of Heidi’s cards are just as cool as the fronts. 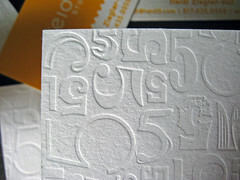 The back (shown above) has a really great pattern created from the number 5 from a bunch of different fonts. 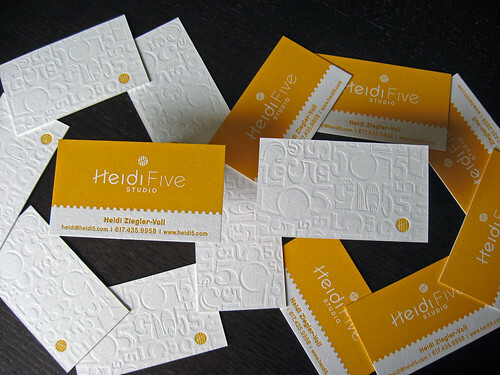 The pattern was printed using transparent white ink to add a slight shading to the design. 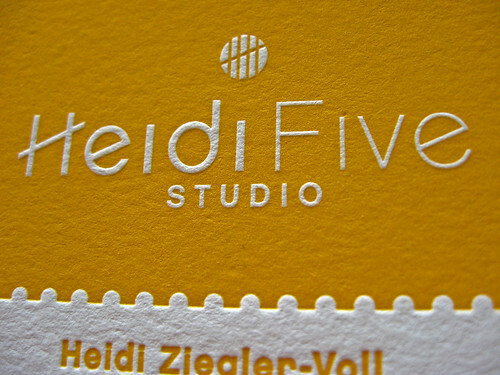 For a pop of color, Heidi’s logo was printed in the same PMS 1225U in the lower right-hand corner of the cards. The photos above show part of the duplexed sheet. 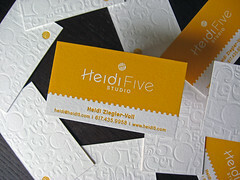 The cards were printed 2-up and then print-and-flipped to print a total of 4 cards on a single 5″ x 8″ sheet. The last picture above shows the crop marks for the yellow over the crops for the trans. white. 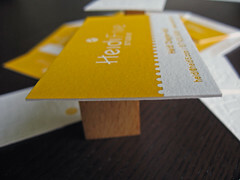 Here’s a photo (above) of the cards all cut down and waiting to be shipped out!